There are plenty of causes of foot pain — many of which can make it difficult for you to stay on your feet no matter how hard you try to work past it. If you're an athlete, you may find yourself wondering what's causing your foot pain. Most critically, is it plantar fasciitis? And if it is, how are you supposed to treat it? If you're experiencing these symptoms, you may have plantar fasciitis. Luckily, there are several at-home treatments that can help relieve your pain and prevent the injury from getting worse. Who's At Risk for Plantar Fasciitis? Plantar fasciitis is a common injury, especially as you move into middle age. Several things can make it more likely that you'll develop this strain in your feet over time. If you fall into any of these categories, even if you don't have symptoms of plantar fasciitis, you'll want to keep a careful eye on your feet to make sure that you don't develop problems later. You're a runner. Runners put more strain on their feet than other individuals, which can lead to strain over time. This is particularly true if you have poor running form or you're wearing shoes that aren't fitted properly, which causes more stress on your feet. If you're a runner and have symptoms of plantar fasciitis, check your shoes! Visiting a running store to be properly fitted is a great way to ensure that you aren't causing more problems for your feet than you can handle. You're overweight. Unfortunately, maintaining an unhealthy weight puts a lot of strain on your feet--and they may eventually start to show the symptoms. If you're overweight, especially if you're starting to experience symptoms of plantar fasciitis or other foot problems, it's time to get started on a diet and exercise regime that will help you drop those extra pounds. You'll be surprised by how much less stress you'll put on your entire body as you drop that unwanted weight. You're on your feet all day. From working as a cashier or a server to working in a factory where you spend your whole day on your feet, there are plenty of jobs that require you to spend a lot of time walking around. When you spend a great deal of time on your feet every day, you put additional strain on your feet--and that can, over time, lead to symptoms of plantar fasciitis. Poor fitting footwear. Your feet are best supported by quality shoes that fit well. When you purchase ill-fitting shoes or shoes with inadequate support, you may struggle with inadequate padding that puts additional strain on your feet. Also note that you should not be wearing shoes that belong to someone else for an extended period of time: over time, your shoes break in to your feet, and using someone else's means that the shoes have been broken in incorrectly for your feet. If you're starting to experience foot pain, especially the sharp, stabbing pain of plantar fasciitis, try buying new shoes that offer adequate support and padding to help reduce symptoms. Plantar fasciitis occurs when the thick band of tissue that runs along the bottom of your foot, connecting your heel to your toes, becomes inflamed. This critical band of tissue is responsible for flexing and contracting whenever you take a step. When it is strained or tiny tears occur in the ligament, it causes pain. In order to reduce that pain, taking these steps can help. Stretch your foot. Before getting out of bed in the morning (or shortly thereafter, if you have to get up urgently) and before exercising, take the time to stretch your feet carefully and thoroughly. This will warm them up and help prevent injury. Stretch your leg out straight, then grasp your toes and pull them gently back toward you to thoroughly stretch the bottom of your foot. If you can't reach your toes, use a towel or band to help extend your reach and get the stretch you need. Roll the muscles in your foot. Using a can or tennis ball, apply firm pressure to the bottom of your foot and roll the affected area. This will help soothe the pain and further stretch the ligaments. Use basic pain relieving measures. This may include applying ice throughout the day and/or using anti-inflammatory pain relievers to help reduce the pain you're experiencing--particularly important if you're going to be on your feet for a long time or if you've got a big game coming up that you don't want to miss. Check your shoes. Wearing athletic shoes with proper support is the best way to be sure that you aren't further aggravating symptoms of plantar fasciitis. Talking with someone at a running store or your doctor may also help you find inserts that will further support your feet, cushioning the stress or otherwise offering comfort. Athletic shoes aren't just for training! If you're struggling with heel pain, wearing athletic shoes throughout the day can give your foot more support that will allow it to heal. Visit your doctor. If symptoms of plantar fasciitis continue to worsen or you're struggling to manage the pain, it's time to visit your doctor! In many cases, your doctor may be able to recommend further treatment that will help reduce the pain of plantar fasciitis and allow your foot to heal. In extreme cases, surgery may be necessary in order to fully correct your symptoms. Use PFTape. When you need relief fast--especially if you're headed back out to exercise again in spite of the pain--PF Tape will help support your foot and offer immediate relief from the pain of plantar fasciitis. It's easy to apply and designed for a single use, making it perfect for those days when you simply don't want to miss your run or you're headed out for a big game in spite of foot pain. Living with plantar fasciitis isn't any fun, especially if you're an active individual who needs to be able to get out the door and get in your workout. 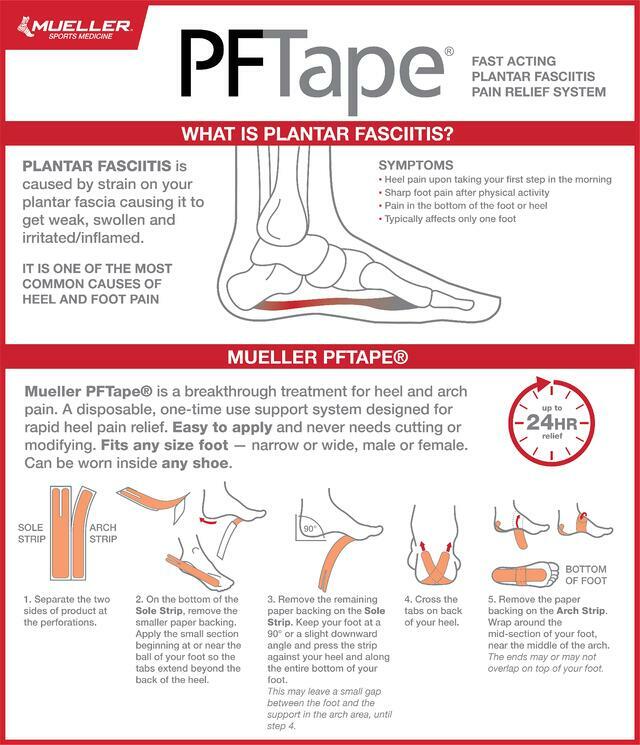 PFTape® Plantar Fasciitis Pain Relief System provides great relief for painful Plantar Fasciitis symptoms. It helps relieve morning heel pain and provides therapeutic support on the foot. PFTape® is not basic athletic or kinesiology tape, it is more sturdy to give you the support you need.